Albuquerque, NM — Edgar Camacho-Alvarado, 23, was shot and killed by police this weekend while police were searching for a murder suspect in his neighborhood. The young man was not actually guilty of any crime, nor did he pose a threat to officers, and he never even attempted to interfere with their investigation. He was simply at the wrong place at the wrong time, working to fix the engine in his truck in the driveway in front of his home. The police are refusing to release any further information about the shooting, but Edgar’s family wants answers. “This morning, we got a call about APD and U.S. Marshals being at my aunt’s house. We have no idea why they shot him. He passed away instantly. They were looking for someone else and they killed him,” Perla Alvarado, Edgar’s cousin told KRQE News 13. “What’s going to happen to my cousin? Is there going to be justice served? We need justice,” she added. The Marshals allegedly thought that Edgar was their suspect and shot him “by accident,” but exactly how it happened is unclear. “They said they have made a mistake because he was out there at the wrong time. There’s no such a mistake by killing somebody. There’s no accident,” Alvarado told reporters. Immediately after the shooting, the Marshals realized that they had shot the wrong person, and then they began a standoff with occupants of a nearby trailer where the actual suspects were staying. The family was also concerned about how the situation was handled after the shooting. Officers just left the dead body to lay in the driveway and did not even bother to call an ambulance or attempt to give any kind of medical help. “For this to happen is outrageous. It was a wrongful death. They didn’t even ask his name before shooting. What they’re upset about is that they didn’t bother calling an ambulance. That hurt more than anything,” family friend Minnie Mirabal said. 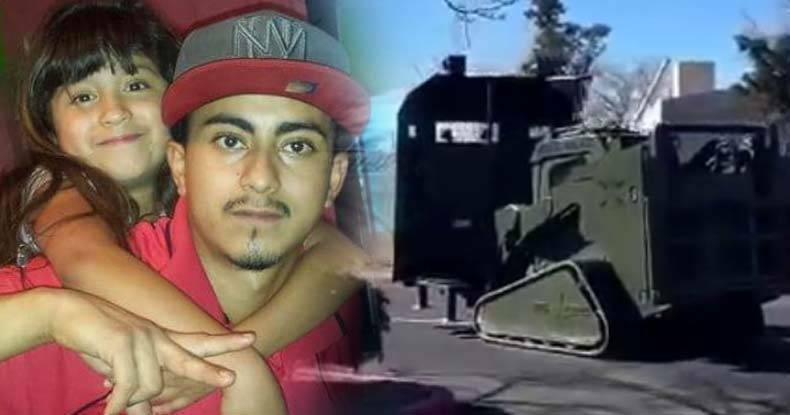 Edgar’s mother says that she ran out of the trailer screaming “don’t shoot” as the shooting was happening, but she was pushed away by the officers, and no one in the family was able to go anywhere near Edgar. PINAC reported that the victim’s little brother had his cell phone confiscated by police and that it is possible that he recorded the killing on his phone. The family said Camacho-Alvarado was planning to get married next month. A Go Fund Me page has been set up to help his family deal with the aftermath of the shooting. The officers who killed this young man are just as bad, if not worse than the homicide suspect that they arrested later that day.